In what was a surprising move – even for a franchise that is synonymous with dysfunction – the Cleveland Browns fired head coach Rob Chudzinski Sunday night after just one year on the job. And Browns fans are left wondering why they should believe anything that comes out of the mouths of team owner Jimmy Haslam or CEO Joe Banner. Chudzinski becomes the first Browns coach to be fired after just one season in franchise history, so at least Haslam was truthful when he said things were going to be different with him as owner. Officially, the team “relieved” Chudzinski of his duties (how very polite of them), saying they “needed to see progress with this football team. We needed to see development and improvement as the season evolved and, unfortunately, we took a concerning step backward in the second half of the year. Mostly sat out the 2013 NFL Draft after selecting Barkevious Mingo in the first round? Sat on more than $20 million in cap space? Made no attempt to fix the problems at offensive guard? Made no attempt to fix the problems in the secondary? Made no attempt to fix the problems at inside linebacker? Made no attempt to fix the problem at running back? With that kind of urgency, the Browns should be good around 2020 at the earliest. Chudzinski said he was “shocked and disappointed” to be fired. You have to wonder, though, how shocked Chudzinski really was to hear the news since he worked for the organization twice before and should have a better understanding than most how things work in Berea. While Chudzinski certainly deserves his share of the blame for another 4-12 season, it’s hard to see what moves he could have made that would have made a difference. He benched Brandon Weeden after two games and only went back to him after Brian Hoyer was injured. After the euphoria of Jason Campbell and his “moral victories” wore off, Chudzinski was left with the choice of Weeden – clearly not an option – or Campbell, who showed with his 1-7 record as a starter why no other team in the NFL was looking to sign him as a free agent last season. You could also blame Chudzinski for the defense, which gave up 406 points this season – the most since 2000 – and was near the bottom of the league in both red zone defense and third-down efficiency. Of course Chudzinski isn’t the defensive coordinator. Gave Desmond Bryant, a good player with a heart condition, $15 million in guaranteed money and Kruger, a good player who is not a difference maker even though he is paid like one, $21 million in guaranteed money. Gave Bess a contract extension after trading for him. Gave John Greco, who may not be very good, a contract extension that includes the second-highest roster bonus due to a player on the team in 2014. Drafted a cornerback in the third round in Leon McFadden who couldn’t beat out Chris Owens, a player the Browns ultimately released. If Chudzinski was the wrong man for the job, why is he the only one being held accountable? Shouldn’t the people who hired him and built the roster also be in question? Banner conveniently forgot to add the part about how the new coach only had 11 months to create the culture for the entire program. In firing Chudzinski after just one season, Banner is sending the message that he believes the roster is more talented than the record would indicate, something he talked about in his introductory news conference more than a year ago. That raises a bigger question, one that combined with the firing of Chudzinski, should make Browns fans very nervous about the decision-making capabilities of the people in charge. The majority of the team, including top players Josh Gordon, Jordan Cameron, Jabaal Sheard, Phil Taylor, Joe Haden and T.J. Ward, was put together by former general manager Tom Heckert. So if this roster is so talented, why did Banner fire Heckert in the first place? This latest move is just another in a series where Banner and general manager Mike Lombardi come off as wanting to show everyone that they are the smartest guys in the room. But as a wise person once told us, it’s OK not to be the smartest person in the room because that is how you continue to learn and continue to grow. Maybe if the Browns had put that on a wall in Berea, the team would be further along in its latest rebuild. During Monday’s news conference announcing the firing, Haslam and Banner worked hard to try to convince the fan base, and probably themselves, that this isn’t a step backward for the franchise. As to why a coach would be willing to take a job knowing the front office will throw him overboard at the first sign of trouble? Well, Haslam didn’t really answer that question. But with everything that has gone on in the past year, why should fans believe anything these two say? Haslam at least acknowledged that the front office has betrayed the trust of the fans. 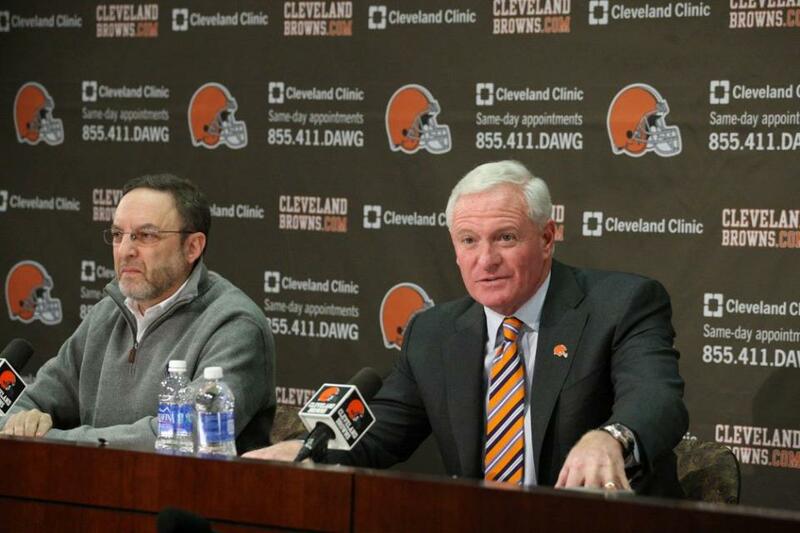 When he took over the team, Haslam promised that things were finally going to be different. But just a little more than a year later, the only thing that has changed are the names. It is going to take a long time and a lot of work to win back the trust of the fans. Until then? Same old Browns.